There's a big chance that the people who read this blogpost, know me through one of my own gaming sites. I run Sims fansites and Spore fansites. For Spore, I traveled abroad to visit E3, so I could see Spore with my own eyes. That was well worth it. Not only did I get to enjoy Spore, I also found true love there! Anyway, back on topic. I visited the Games Convention as well, also for Spore. You can definitely say I am a true fan. Because I can't think of anyone else who would go on several expensive trips only to see a game. Now, in the beginning of this year, I was invited at Electronic Arts to play with Spore. 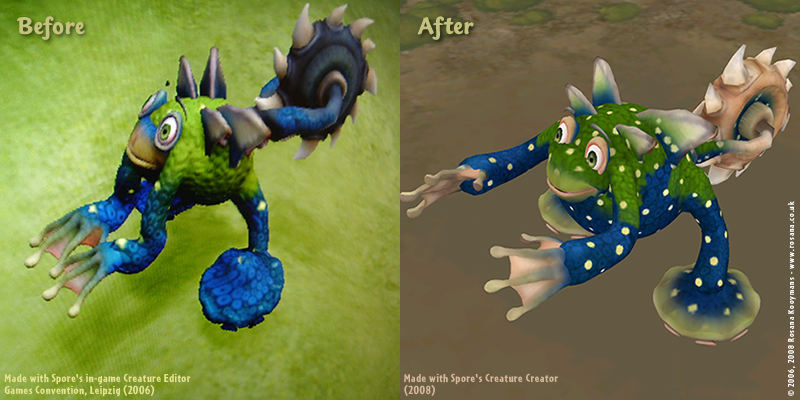 Even though I had seen Spore before on E3 and Leipzig, I only got to play with a few things like the Creature Editor. At Electronic Arts, I was finally able to play with the game itself! This was so awesome, you will find out about it when it launches on September 7! 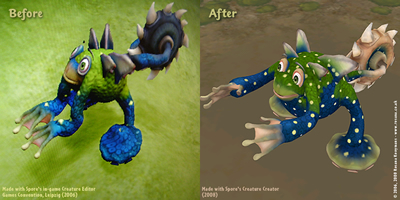 If you are curious about what my experience was about Spore itself, read my preview on SporeNetwork! Tomorrow (June 17) is the day that Maxis will release the Creature Creator. You can download and play the free trial. But as a real fan, I suggest you download it at the EA Store or perhaps buy it somewhere else. It's definitely worth it. And how would I know this? Well if you read this blog post, it should say enough about the many times I already played with it. However that's not the only reason. Because Maxis has given me the opportunity (like many other press and fan sites) to download and play with the full version of the Creature Creator before its release tomorrow. See how it has changed in two years?! I used all of the same parts. But some textures have changed (like the small yellow dots). Anyway. I would just like to take the opportunity to thank everyone at Maxis for making this possible. I can't wait for Spore any longer. But I'm so happy I can play with the Creature Creator in the meantime. Tomorrow everyone can finally play with the Creature Creator. That means that the official Spore site will probably be overwhelmed with new members and creatures. 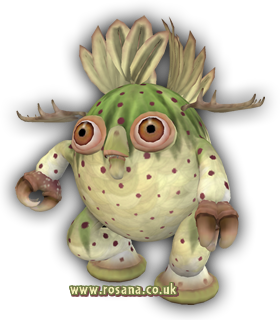 Because of that, I am preparing my Spore sites as well and I'm currently working on SporeNetwork and Sporepedia.co.uk where I will offer creatures. ChEeTaH from TheSporeZone will also upload his creatures on Sporepedia.